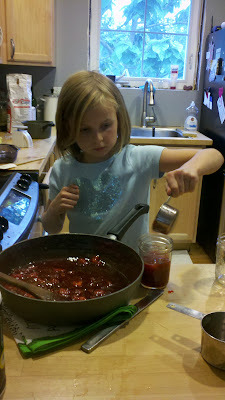 Canning Strawberry Jam with a kid friendly recipe. I'm behind schedule with my canning plans (and grateful to my boyfriend for picking up my slack by putting our pickled radish plans in jars this month) but am excited to have started the season with what feels like the definition of spring: our first farm-picked strawberries. 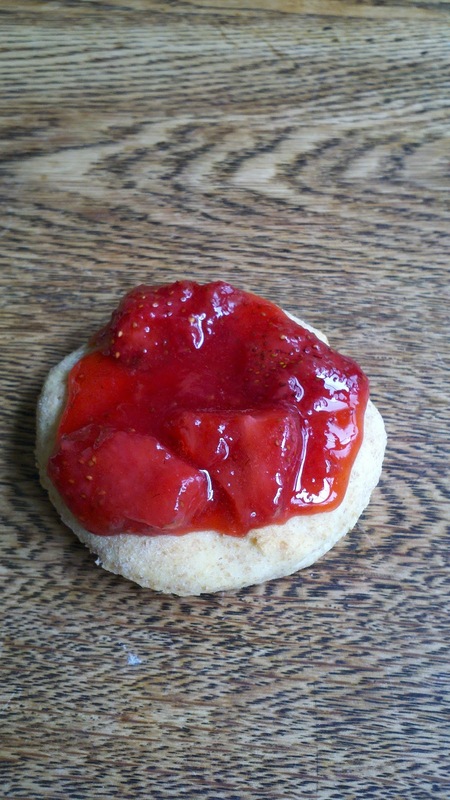 Truthfully, our first farm-picked strawberries were sold at market and the second round put into our CSA boxes as requested, but the "seconds," otherwise known as the ugly and slightly damaged food, made it into my pot. I excitedly offered to make somethin for us all and with little effort produced three jars of jam-- one for each household! Using my trusty canning book, the default for most of my canning endeavors last year and likely this year too, The River Cottage Preserves Handbook provided an alternative recipe to Hugh's favorite raspberry jam. Luckily for you, I found the exact recipe online! Sub strawberries for raspberries, taking care of halve or quarter the large berries. The process was simple: wash and prepare the fruit. Add the fruit to a pan, mash it up a bit. Add the measured sugar and pectin. Heat slowly to dissolve sugar, then boil rapidly for 5-7 minutes depending on the set you want achieved in your jam. To keep my friend (one of the cutest farmkids!) 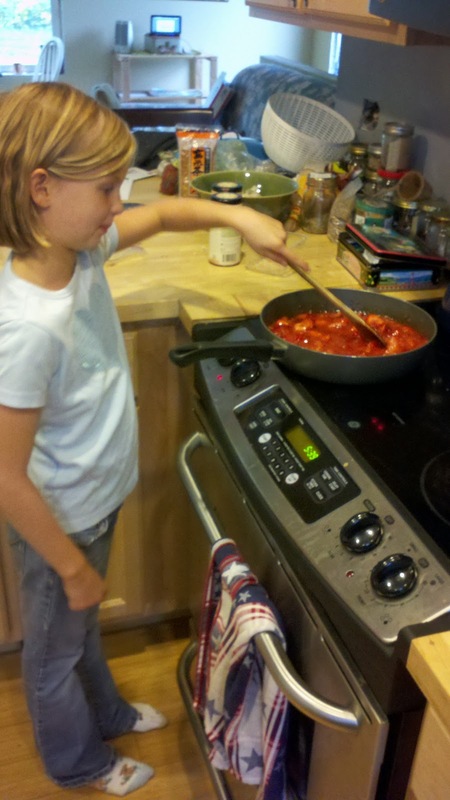 involved, she measured out the needed sugar, mashed up the strawberries, and took care to stir the mixture as the sugar dissolved. Allowing the jam to cool for ~5 minutes gave a chance for the fruit to settle and not float to the top, then we jarred the jam quickly into sterilized canning jars and sealed them. This is a refrigerator jam so we didn't bother to water-bath boil since we're eating it straight away. Like tonight, with homemade biscuits that failed to rise. Oh well! And then for breakfast again.